As a child, Angela Cervantes rarely encountered books with Mexican-American characters. Her father, however, would bring home biographies of Mexican artists or mythologies of the Mayans and Aztecs. From that discovery of the iconic Mexican artist, Cervantes bought her diary and has visited Kahlo’s child-hood home at least four times in an effort to get to know the artist. 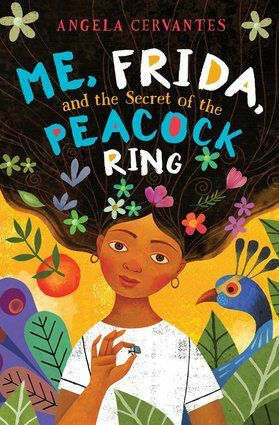 Her latest children’s book, “Me, Frida and the Secret of the Peacock Ring,” pays homage to Kahlo. The book’s main character Paloma Marquez is a Kansas girl — just like Cervantes — accompanying her mom on a four-day trip to Coyoacán, Mexico, where Kahlo’s home, La Casa Azul, is located. During the trip, Paloma attempts to solve the mystery of the missing piece of jewelry that once belonged to the artist. The book was published in March of this year and was recently named to the Texas Library Association’s Texas Bluebonnet Award Master List. Cervantes, who lived in Brownsville for two years in the mid-1990s when she was a part of AmeriCorps, will be one of the featured authors at the 2018 South Texas Book Festival on Saturday in McAllen. The award–winning author’s other books include “Gaby, Lost and Found,” “Allie, First at Last” and a junior novelization of Disney Pixar’s smash animated film, “Coco.” All have strong Latino leads. Events such as Saturday’s allow Cervantes to speak about diversity in literature. She said she tries to write the books she wanted to read when she was a 10-year-old girl. One of the reasons she enjoyed being a part of the “Coco” book was because she knew many families would relate to the Dia de los Muertos. The story, Cervantes pointed out, includes a “beautiful, important holiday” for Mexico with a strong, young male Latino lead. The book festival begins at 10 a.m. and is a free event held at the McAllen Public Library’s main branch and includes readings, panel discussions and book signings. For more information, visit southtexasbookfestival.com. WHERE: McAllen Public Library Main Branch, 4001 N. 23rd St.